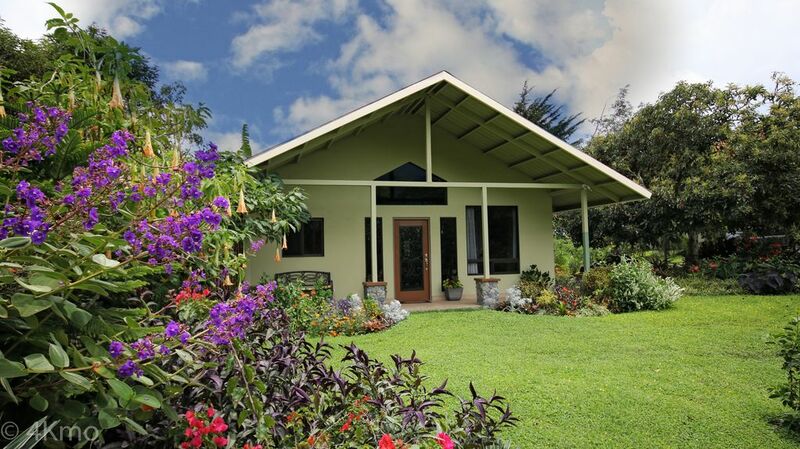 Private 2 bedroom,1 bath Home located deep within a coffee and avocado estate. A resident of Boquete for the last 10 years, Mary Ellen arrived on a sailboat, fell in love, and now with complete gratitude calls Boquete home. She designed this guest house for the enjoyment of the vistas, flowers and peace-filled natural beauty of the property she loves so much. She enjoys teaching and helping others teach art programs to the children of Boquete. A day trip with two hours of travel can put you in the Pacific Ocean, Whale-Watching is best between August and Mid-October. Host -right next door if you need anything but never intrusive. We can not recommend it highly enough. Thank you so much Ian, so glad you were able to enjoy some of the peace and beauty, as you were enjoying ALL of the JazzFestival!!! Special time here in sweet Boquete!! We were immediately charmed as we entered the driveway to the Alba Verde Guest House. Its situation overlooking Volcano Baru is impressive as well as all the colorful gardens and abundant fruit trees. Mary Ellen is wonderful host. She is a kind and very caring person, truly interested in making her guests feel comfortable and providing them with much local knowledge of the Boquete area. We enjoyed a variety of patio seating, one off each of the good-sized bedrooms and especially at the front where comfortable chairs made for great viewing of the gardens, mountains and very active birding station. This was a highlight for us and we observed many species during our two-week stay in January. The rental home was well-equipped and the beds very comfortable. In summary, our host, Mary Ellen, the beautiful accommodations and the charming area of Boquete made for a winning combination and memorable stay. We would not hesitate to book this property again. Thank you so much for your sweet words. I really enjoyed your visit, please come back. While the locale is spectacular in itself, Mary Ellen has obviously taken great care to make this property very special. The natural beauty of the lush tropical environs surrounds you at every turn and the views are stunning. Boquete is a special place, with many fine restaurants and things to do, and this place is close enough to all of them, while at the same time removed enough to give you peace and quiet from the hubbub of a tourist town. Mary Ellen has a large collection of maps and information about the area as well, and the kitchen is well equipped. You'll want a high clearance vehicle for the driveway! So glad you enjoyed all there is to enjoy here in Boquete. The roads are finally smooth and newly paved! But if you wish to be an explorer, high clearance is the thing to have.Please come back soon. I was very impressed with the property itself and the location. The property is only a quick 10 minute drive from town, but feels like you are in your own beautifully landscaped mountain retreat. The views are awesome and the fruit trees are everywhere. We arrived on Jan. 1 and the oranges and avocados were ready for picking, and so were the limes and tangerines. We had fresh juice and avocados for the 4 days we were there. I read the reviews and agree that renting a RAV4 was a good idea since the entrance is steep but easily manageable with an SUV or quality car, plus the RAV4 was useful for driving and parking around town and going to the trails. We saw the lost waterfalls (very cool), went to the top of Volcan on a 3am Jeep tour to see an amazing view of the David, Boquete and many little towns even into Costa Rica twinkling in the night down below, then enjoyed a colorful but freezing cold sunrise and amazing view of the Pacific Ocean, unfortunately the Caribbean side was too cloudy. We enjoyed all the recommended restaurants in Mary's thorough binder of information. Even though she was not there until our last day, we had no problems or questions because her friend was there to let us in as promised and everything is in the binder. We enjoyed meeting Mary on our last day and wished we had more time to drink coffee and learn about the area. It's definitely a beautiful place to retire someday with the best weather imagineable, friendly people and lush nature everywhere. Wow! Thank you for that beautiful review! Also sorry I missed sharing a cup or two more of the wonderful coffee with you. So glad you really packed it in the short time you were here..it seemed you really savored it all! Please come back. It’s like the garden of Eden except it has a better view! You don’t know what you don’t know so I guess I couldn’t be mad at myself if I had never come here. However, having been here I can’t imagine missing the opportunity to have done so. The guest house, Mary Ellen, the surroundings, and the view could not possibly be better or nicer. We were fortunate to be able to extend our stay and there’s no place that we would rather be. We especially enjoyed having coffee each morning on the front patio staring up at the peak of Volcan Baru. We also liked being surrounded by a tropical Garden which affords a great deal of privacy. My husband and I enjoyed 6 days with our niece at this lovely house in the mountains. It was only 10 minutes to town, but away from all the noise and road construction and a really perfect spot on earth. Mary Ellen is a lovely and helpful host who is sharing her private guest house with others. Our weather was wonderful, but had we had a raining day -- we could have just stayed home and enjoyed the view. The landscapes and mountains inspired us to ask Mary Ellen for an art class which we so enjoyed. I had never painted anything in my life, but we had so much fun trying and have a much greater appreciation for water colors. Thanks again Mary Ellen, your guest house is just perfect! I am so grateful!! Loved turning you on to the magic of watercolor! !